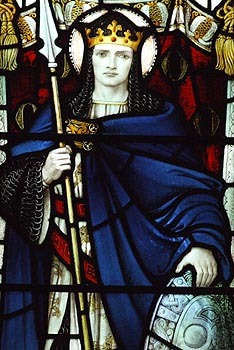 St. Oswin grew up in the political turmoil of early 7th century Northumbria. In AD 633, his father, Osric, had managed to secure the crown of Deira (modern Yorkshire) after the death of his cousin, King Edwin of Northumbria, at the Battle of Hatfield Chase. Bernicia was taken by his rival, Enfrith, but, within a year, both men had been massacred by their enemy, the Northern Welsh and Mercians who were sweeping across the Country. The young Oswin fled to safety in Wessex. While Oswin grew into a burly young man, Enfrith's half-brother, Oswald was accepted by both Bernicia and Deira as King of a united Northumbria and he drove off their south-western invaders. He married the daughter of the King of Wessex in AD 635, but there is no evidence of his making trouble for Oswin. Seven years later, however, Oswald was dead. His brother, Oswiu, became King of Bernicia, but was rejected by the Deirans who recalled Oswin in AD 644. He may have made his peace with the Mercians at this time and used their armies to assert his rights in the north. According to Bede, Oswin was "a man of handsome appearance and great stature, pleasant in speech and courteous in manner. He was generous to high and low alike and soon won the affection of all by his kingly qualities of mind and body, so that even men of very high birth came from nearly every province to his service." He was a great friend of St. Aidan and a man of "piety and devotion". Oswin was, however, despised by King Oswiu who greedily coveted the Deiran lands which had once belonged to his brother. In August AD 651, he raised a vast army, which Oswin was obliged to march out to meet, but, finding he was greatly outnumbered, the King of Deira wisely decided to withdraw from the battlefield and avoid unnecessary bloodshed. He took refuge in the house of his friend, Ealdorman Hunwald, at Gilling in North Yorkshire, but was treacherously betrayed by him. Oswiu sent his soldiers to the manor, on 20th August, and King Oswin was cut down where he stood. He was the last King of the House of Aelle. Oswiu's wife was Oswin's cousin and she insisted her husband build a monastery at Gilling in expiation for his crime. Oswin was, however, buried at Tynemouth in Northumberland. He was culted as a Christian martyr because he had died "if not for the faith of Christ, at least for the justice of Christ"; and his shrine became a popular place of pilgrimage.